As I’m sure you are aware, my presence in the blogsphere over the last few weeks has been rather minimal. It’s been a difficult and challenging time for me lately; I’ve felt very uninspired and unhappy with both my life and myself so I haven’t had the motivation for anything really. One day I hope I will find the courage and the right words to write about my recent experiences. I’m feeling a little better and I’m definitely trying to be more positive but lets just say I could do with some support right now. I’m ready to be here again; I’ve missed it. The weather has been substantially sunnier and warmer lately. I can definitely tell that spring is on its way. I can’t wait until I can wear my pretty summer dresses again. 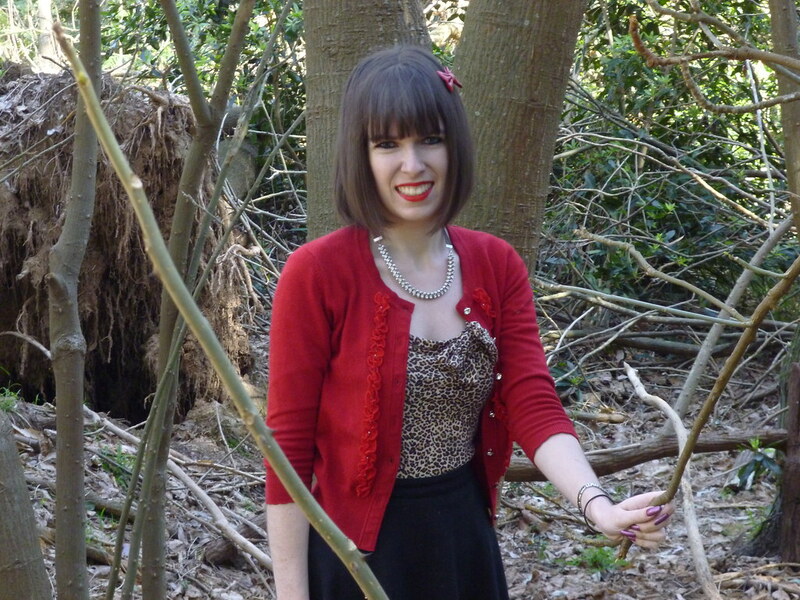 I’ve certainly worn this red Alannah Hill cardigan a lot this winter; it’s definitely my most worn item of the season. This is good for my blog because I’ve wanted to start a series of remix posts for awhile where I show all the different ways I’ve styled an item. Ive seen this idea on a few other blogs and I’ve always thought it was a cool idea. Once I’ve accummulated enough photos, I’m sure this will be my first item. I desperately want to curl my hair (preferably without heat) but I have no idea how to. Does anyone know how to do this (especially relevant to short hair). Please let me know. 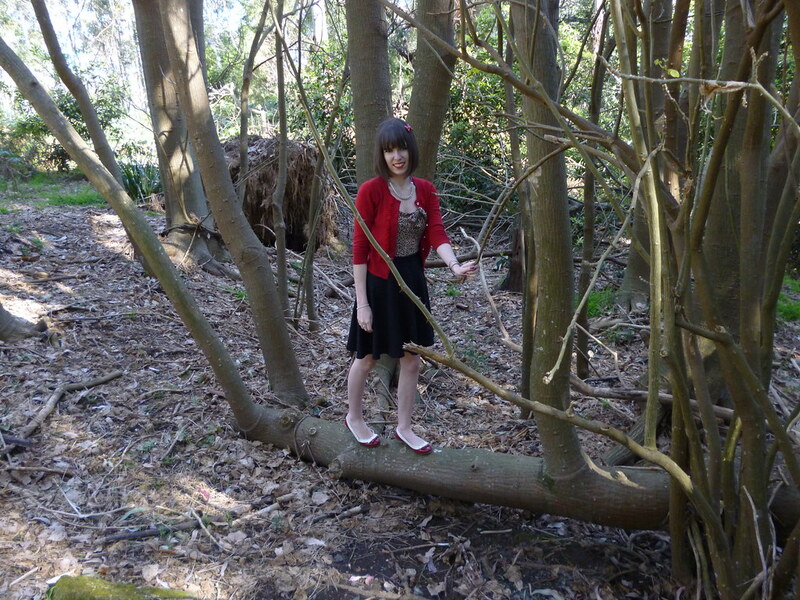 This entry was posted in Alannah Hill, Dangerfield, Outfits, Wittner. Bookmark the permalink. Hi dear, I am really sorry to hear that you are unhappy now, hope everiything will soon get better for you! You look adorable in this outfit for sure! You always have my support, darling! this leopard top is great on you ! Ahhhh, you are rocking the animal print! Meeeowww, indeed. You look lovely. 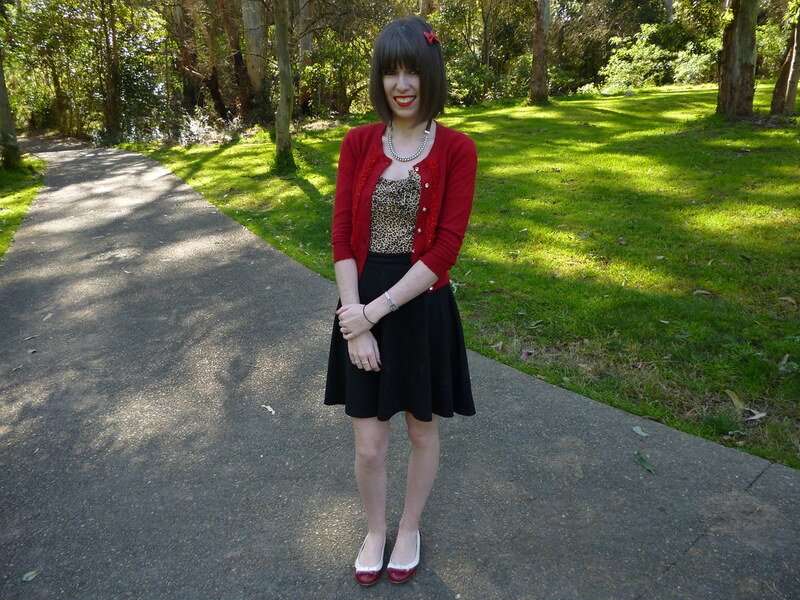 I adore the red cardigan with it. Another adorable yet flawlessly glamorous outfit from you. 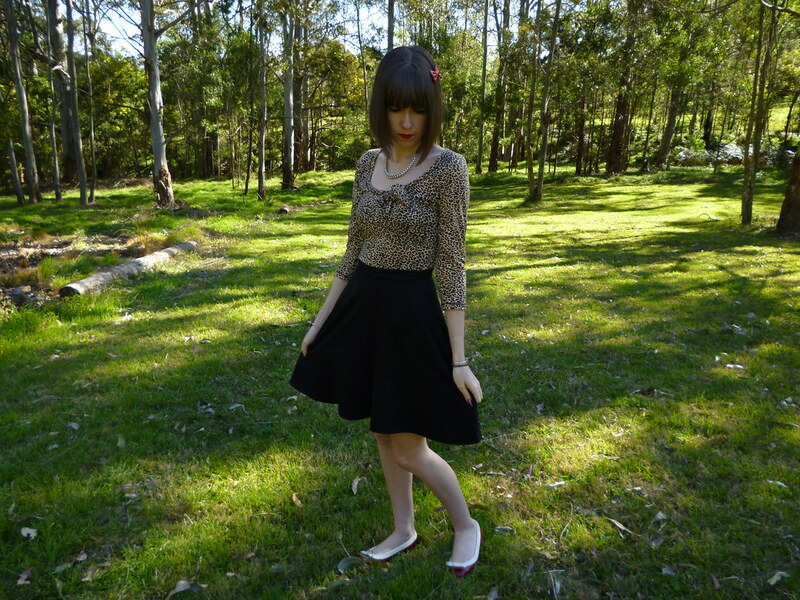 Imogen you always look so ladylike and lovely! Likewise, here! I love your girly chic combinations. Hope everything starts to feel better for you soon! I love the look here. The leopard print with the red is a great combination. About curly hair: I heard/read that if you roll it up and pin it while wet and leave it for a while to dry, it becomes curly? Not sure if this works . and do hope you find more comfort and courage. in the post I just did titled: National Underwear Day Pop Up Event in New York City. Love the Alannah Hill Cardigan and the Revival Skirt. Your pretty lipstick goes perfectly with the cardigan. Even though you want desperately to curl your hair, I think your hair looks pretty in these photos and the hair bows you wear are cute. I hope you cheer up soon and that things get better for you – and that your coming Spring will be wonderful. aw im sorry to hear you are going through this, we all have these times in our lives i think and although it is cliche to say it is important to focus on the positive, and anything you don't like you can work on changing and pushing forward! chin up girl! I hope you start to feel better soon, and that things start falling into place for you. you look gorgeous as per usual. I'm sorry to hear that you've been having a rough time lately. Hopefully you know you have a lot of love and support out here in the blogosphere! I really hope you feel better soon. As for hair curling without heat, I recently discovered a super awesome/easy way to go about it on The Paper mama's blog – check it out here: http://thepapermama.com/2011/07/hair-tutorial-no-heat-curl-html.html. I've tried it out a few times and its worked BEAUTIFULLY. And I'm terrible at styling my hair. Aw, I'm sorry! I'm loving the animal print with the red, you look great! You have a style I wish I could pull off and I'm always jealous of your cardigans. I really hope you feel better soon, I know how hard it can be to be unhappy – you feel guilty because you struggle to find joy in anything, yet many would kill for you life. But sweetie don't feel guilty, its OK to be unhappy, sometimes it just cant be helped. You have my support id you need it! I haven't been able to blog as much either which really bums me out. 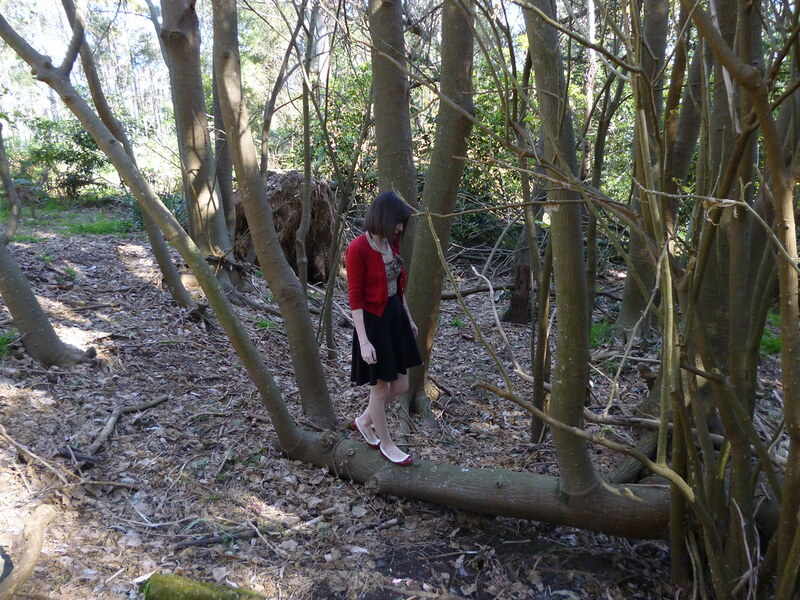 I've been trying thought because I love blogging so much. Hope you can find the inspiration to stick with it. You look lovely! Love the print on your top, and I hope everything works on well. Also, if you're looking to curl your hair without heat you can try those rubber curling rods. I hope you feel inspired soon. I was in a similar situation yesterday, where something that happened that day made me feel really depressed for the whole night. But positivity is the most important thing. Changing your attitude is the hardest part but it will make such a huge difference. Lovely outfit! 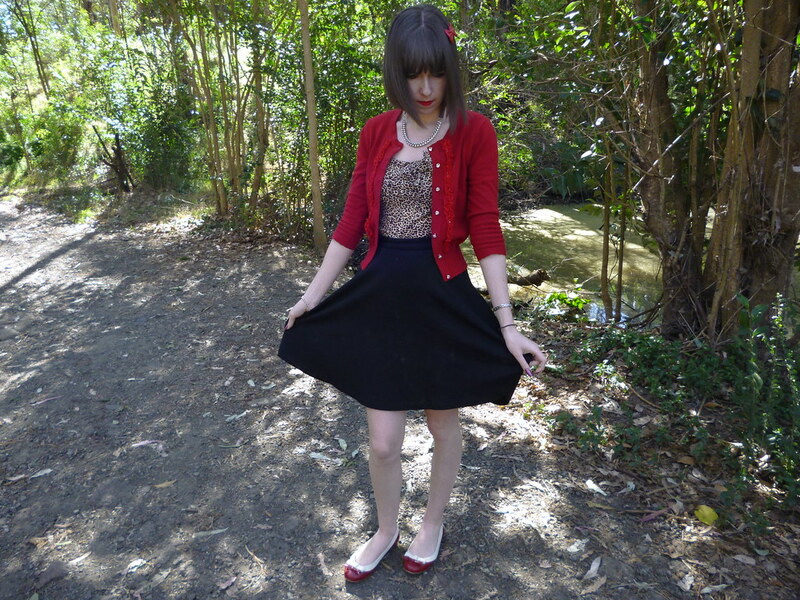 I like the leopard print against the red cardi! Hope everything is going okay for you and you are not too unhappy at the moment!